ARIEL Vanguardia expected RJ Jazul and Cyrus Baguio to make a statement against their former teams. 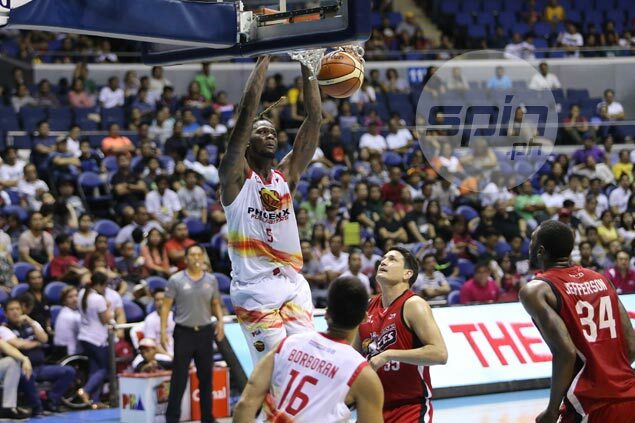 The Phoenix coach got more than just that on Friday night as Jameel Mckay carried the Fuel Masters to a 94-86 victory over depleted Alaska at the Smart-Araneta Coliseum to get back on the winning track in the PBA Commissioner’s Cup. While Jazul and Baguio delivered in their own right, Mckay proved the biggest thorn for Alaska as he scattered 42 points and 22 boards in 44 minutes before going out with cramps with the game all but decided. Baguio added 12 points and six boards, while Jazul chipped in 10 points and eight assists for the Fuel Masters, who snapped a two-game skid and improved to a 3-4 win-loss card. The Aces, missing star Calvin Abueva who joined Vic Manuel and Chris Banchero on a growing injured list, suffered their second successive loss after starting the conference with four wins. “And Jameel is getting better every day, and we know how to play with him,” he added of Mckay, who completed a monster effort with two blocks, two steals, and one assist. Mckay set the tone early, scoring 17 points in the first period, alone, as he ended up scoring the second-highest output in a game this conference – just behind his Phoenix predecessor, Eugene Phelps, who pumped in 53 points along with 21 caroms in his first and only game this conference. The current Phoenix import outplayed Aces counterpart Cory Jefferson, who registered 31 points, 13 boards, five blocks, one steal, and one assist in 44 minutes as he found little help from the locals. JVee Casio was the only Alaska local who scored in twin digits with 14 points built around three treys as Simon Enciso failed to make a statement against his former team, finishing with just five points against six assists in 33 minutes as a starter.